Aimed at medium-to-larger sized premium cinemas, the Alcons three-way Cinemarray™ CRA24WX is designed for Digital Cinema applications where maximum quality sound reproduction and perfect coverage are required. 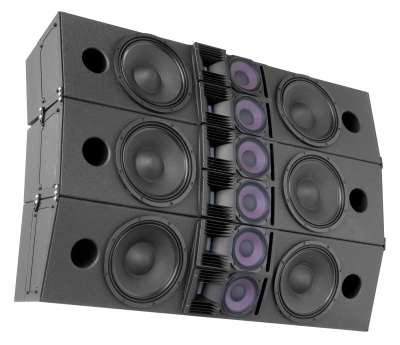 Featuring two patented RBN401 pro-ribbon drivers, the CRA24 delivers remarkable clarity, intelligibility and delivers an uncompressed linear response at any SPL. With up to 90% less distortion and very high (1600W) peak power handling, the HF section allows maximum screen compensation without any audible stress on the driver. The patented horizontal dispersion also extends the stereo imaging to a larger number of seats in the auditorium. Along with the twin RBN401 HF drivers, the CRA24WX features a pair of vented 6.5” mid-range drivers and a pair of vented 12” woofers, with 3” voice-coil design for LF reproduction. With a usable frequency response of 39Hz - 20kHz and a system efficiency of 105 dB, the CRA24WX delivers sound of exceptional quality and impact for any content. By implementing line-source technology throughout the system, a flat SPL coverage from front to rear is realised, with the ‘proximity’ effect dramatically improving the cinema experience for the audience further away from the screen. The precise projection also minimises unwanted acoustic reflections. Two different horizontal dispersion models are available, the CRA24WX/90 (90º) and CRA24WX/120 (120º), both offering vertical coverage of 30º. The enclosure design enables the assembly of wide vertical coverage arrays (multiple CRA24WX only), or as under-fill in mixed arrays (CRA24WX under CRA24N array). The Cinemarray™ system is powered by an ALC Sentinel amplifier loudspeaker controller, offering system dedicated processing, optimisation and protection in factory presets for maximum sound quality and the ultimate operation reliability. The Signal Integrity Sensing™ pre-wiring ensures complete cable/connector compensation between the CRA24WX and ALC, significantly increasing response accuracy, regardless of cable length and system impedance, delivering tight, accurate mid and bass response. The result was Cinemarray™; the first scalable, full-range array system for sound-for-picture applications, that enables an optimal cinematic sound experience from the first to the furthest seat in even the largest cinema applications. As such, the Cinemarray™ is also increasingly installed in theatre/cinema hybrid applications, such as Clay Center in Charleston, WV USA, Lucas Theatre Savannah GA USA. Other cinema references include Pathé Tuschinski Amsterdam, VUE cinemas, Eye Film institute the Netherlands, CinemaxX Mannheim Germany, Oslokino Colosseum Norway.